Disasters do happen. Are you prepared? That is the question the National Disaster Management Office (NDMO) of Fiji keeps asking the general public. On a more practical level, the unit has also been helping people and organisations to better prepare for disasters through drills and training programs. The drills have always been run in a more traditional way, until this year the NDMO decided to take advantage of the South Pacific Flying Labs’ resources to monitor and improve the effectiveness of their sirens and Tsunami Evacuation Drill. Fiji and its neighbouring South Pacific island countries like Tonga and Vanuatu face several minor earthquakes almost every week due to their geographical location which is tracked and can be viewed on the Earthquake Track website. In many cases, many of the islands have been lucky: either the earthquake was too far away or too deep in the ocean to have any great impact on land. 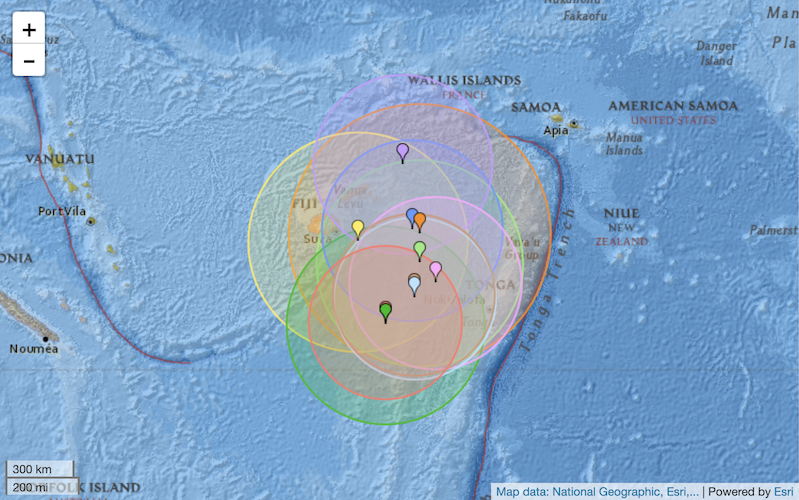 The last significant earthquake that occurred in Fiji in 1953 was of 6.6 magnitude. It claimed the lives of 8 individuals and left devastating infrastructure damage behind. While there has not been any recent major earthquakes to trigger a tsunami, South Pacific Flying Labs still believes and works towards better preventative measures to avoid such loss of lives. The main aim of this exercise was to assess the readiness of participating organisations and identify improvements in a coordinated tsunami drill response. With the help of drones, the team was able to provide real time video feeds to the National Emergency Operations Center from three different sites. They, in return, were able to communicate with their drill wardens on the ground and help in the coordination of movements. More than 4 campuses and the Fiji Sports Council evacuated their premises, and made their way to assembly sites. Several drill wardens were spread out all along the evacuation routes to direct people to safety and maintain levels of panic and hysteria. The exercise was completed within an hour and the simplicity of the project allowed everyone involved to find gaps in the evacuation exercise. It was noted that while the officials were doing their job according to standards, many individuals deviated from designated routes and showed lack of cooperation. From the exercise it was apparent that more awareness on the seriousness of these drills needs to be done and more officials need to be on the ground to ensure that people do not proceed to wrong routes. South Pacific Flying Labs is funded by the Australian Government Department of Foreign Affairs and Trade’s (DFAT) innovationXchange (iXc).